Amusement parks and recreational theme parks can quickly propel the Aspergers (high-functioning autistic) youngster into total overload if you, the parent, are not careful. Your youngster may have enthusiastically anticipated the trip, but no youngster deliberately seeks the public embarrassment and humiliation of a meltdown near the exit to the roller-coaster ride because of improper planning or pacing. This “behavioral” communication (i.e., meltdown) is a last resort when all else has failed. 1. At first, start slow with gentle rides, paying careful attention for signs of over-stimulation. 2. After each ride, process the experience with your youngster to gather his impressions and tolerance level. Some children absolutely relish the sensory feedback they derive from seemingly violent, whirling, spinning, upside-down-turning rides – but some don’t, and after the ride is over, they may flip into a full-blown meltdown. 3. Allow your youngster to record the highlights of your activities with a camcorder, with your youngster directing the “movie” and providing the narration, of course. 4. Appoint your youngster the responsibility of taking photographs to share with family and friends. Disposable cameras make this easy and inexpensive, even if you are also using a camera of your own. 5. At some point during the day, know that your "Aspie" may need the total solitude offered by a nap or reading time in the hotel room. 6. Be aware that many amusement rides feature flashing and spinning lights that may vary in intensity or kick up in intensity once the ride starts. The concern here is that this constant “strobe light” flickering may induce a meltdown in those Aspies who are overly-sensitive to visual stimuli. 7. Before arriving at the park, play visual memory games about the surroundings, review the day's written agenda, and discuss what you anticipate may be experienced on the rides. 8. Consider museums. Museum may provide a calmer, slower-paced atmosphere that your youngster may find conducive to becoming absorbed in the subject matter. 9. Consider purchasing an “easy pass” or “fast pass” offered for some attractions. Learn about the rules and premium costs involved to access such a system. The passes may be available only at certain times for certain rides, which may cause you and your youngster to rearrange your schedule. 10. Create a “schedule-of-events” with your youngster before arriving at the park. 11. Engage your youngster in assisting you to prepare for attending a theme park by researching all the details (e.g., how far, mode of travel, where to stay, how much, etc.). 12. Ensure that your Aspergers youngster is clear in understanding the written rules about the ride (e.g., keeping arms and hands inside, staying seated, etc.). 13. Have a quiet lunch somewhere in order to give your child a break from the environmental stimuli (e.g., noise, congestion, etc.). 14. If the theme park is located in an area with other “spin-off” type activities and amusements on a smaller scale, consider attending one of those instead of the park. 15. If there is a way to link any of the theme park activities to one of your youngster's passions, do it! For example, if your youngster is interested in monkeys, then the nearest zoo might be a better option over some other attraction. 16. If you feel anxious about how you would feel riding a certain ride, it's probably a good measuring tool to deny your youngster admittance. As a guide, many amusement parks offer brochures that are coded to indicate appropriate age levels. 17. If your youngster becomes easily distracted by noise — especially unpredictable noises like train whistles, buzzers and bells, or other loud sounds emanating from rides — wearing an iPod and listening to favorite music will be a good survival tool. 18. In addition to scheduling downtime, it may be best to pace the sequence of activities (e.g., riding a roller coaster followed by attending the dolphin show, then on to an exhibit display before tackling another fast-paced ride). 19. Know that riding certain rides can look tempting and exciting — until you're a passenger!!! Take the time to carefully observe any ride you are considering with your youngster prior to boarding. 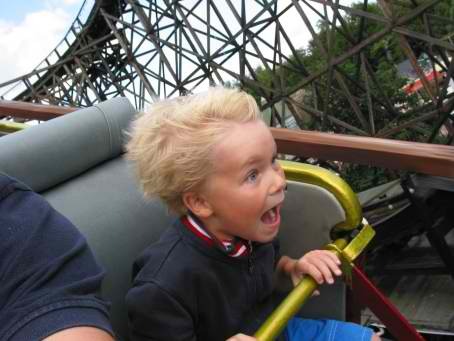 The thrill of most amusement rides is based on surprise, fear, and strong centrifugal force. The extreme emotional and physical stimulation may be too much for your Aspergers youngster to endure. 20. Make sure that your youngster (a) is hydrated with cold drinks throughout the day, (b) wears sun-block (and a hat, if tolerated), and (c) stays as comfortable as possible while waiting in very warm conditions. He may not know to express his growing discomfort or may be oblivious to it entirely. 21. Many theme parks offer a faster, alternate line for children with disabilities to quickly board rides and other amusements. Selecting this alternative may be ‘stigmatizing’ for your Aspergers youngster, however many moms and dads with Aspergers kids swear by this convenience. 22. Stick to the schedule to the very best of your ability and pay attention to your youngster for any signs that the vacation is wearing thin on him, which he may not be communicating. 23. Theme parks are notorious for large crowds and long lines. You know your youngster best and have a sense of his endurance and tolerance thresholds. Build in breaks and downtime throughout the day. 24. Waiting in line can be a frustrating exercise in patience for many children. The Aspergers youngster may not immediately understand why it's necessary to wait in line. It may be helpful to prepare a written story, in advance of the trip, to review with your youngster before and during long waits in line (include details about what to do and how to conduct oneself while waiting). 25. Weigh whether you think an amusement park vacation is appropriate for your youngster in the context of your family makeup. In reference to Item No. 21, I happen to use this one with my son on several occasions who is a high functioning aspie. However, he can not tolerate long lines because of the wait time (over an hour). He has never felt stigmatized nor has he recognized feeling different. He remains pretty much in-tune to himself at the moment and doesn't care what others think of him. I think most aspies are this way, i.e. into self. If anything, he probably feels pretty special that he gets through faster than everyone else and is pretty proud of himself and doesn't care how he does it. He has one mission in mind - get on the ride and get on it as fast as possible. You can get a special needs pass that is like paying for a fast pass or other type of line skipping pass. This has really helped us and hope it helps others too. Just go to your guest services or customer service desk upon entry to the park or ask when you are paying for your pass for a special needs pass and they will direct you.